American Trails — a national, nonprofit organization with a mission to create and protect America’s network of interconnected trails — is hosting its 2017 symposium in Dayton. Five Rivers MetroParks is one of nine local event partners for the event, which will be attended by hundreds of trail professionals and advocates from throughout the world. The event will showcase Dayton as the Outdoor Adventure Capital of the Midwest. The International Trails Symposium will include a free public day on Sunday, May 7, and a Trails Rock party on Tuesday, May 9. More information about these public events will be posted soon. Early registration ends Mar. 17. Register online today. 1. EXPLORE the intricate links between the Dayton region’s trail system, its waterways, and its outdoor lifestyle. See how your community can leverage natural resources to create new and enhance existing trail assets. 2. RIDE, ROLLERBLADE, RUN, OR WALK on the nation’s largest paved trail network, with more than 330 miles of off-road, connected bikeways to explore. 3. TAKE A HIKE on the Buckeye Trail, which circumnavigates the state of Ohio, and the 4,600-mile North Country National Scenic Trail which travels through the Dayton region. Or check out the 22-mile Twin Valley Trail and learn how volunteers created a regional backpacking trail located a half hour from downtown. 4. WITNESS THE CHANGE and see how trail and outdoor recreation amenities are helping transform a former Rust Belt center city into a vibrant place to live, work, and play. 5. KICK BACK in the Oregon District, a collection of fun, quirky restaurants, shops, and watering holes located a few blocks from the Symposium site and host hotels. 6. BE A TRENDSETTER and discover the Dayton region’s growing collection of outdoor recreation amenities which are putting it on the map as the Outdoor Adventure Capital of the Midwest. 7. SEE THE HISTORY of the original American trail near the Crossroads of America, where I-75 meets I-70. Traces of that original crossroads along the National Road can be seen in the ghost town of Tadmor, accessible via— what else?— a trail in Taylorsville MetroPark. 8. TAKE IN SOME CULTURE and visit the sites where the Wright brothers invented and tested powered flight at the Dayton Aviation Heritage National Historical Park. Celebrate Paul Laurence Dunbar, the first African American welcomed into the American literary canon. Stroll through the Dayton Art Institute, or take in a live performance in Dayton’s vibrant arts scene. Visit Carillon Historical Park for a dose of Dayton history and a pint from an 1850s-style brewery. Learn why “Dayton” is synonymous with “peace” to millions worldwide since the Dayton Peace Accords, ending the Bosnian War, were reached at Wright- Patterson Air Force Base in November 1995. Attendees can get a taste of much of this by visiting the National Museum of the United Air Force, the oldest and largest military aviation museum in the world (easily accessible from downtown via a bike ride along the Mad River Bikeway). 9. TAKE A SMALL-TOWN SOJOURN to one of the distinctive communities within a 30-minute drive of downtown Dayton and see how trails play a role in smaller cities. Say hello to your friends at the Rails-to-Trails Conservancy’s Midwest Regional Office in Yellow Springs or check out the growing outdoor assets in Troy. Both are home to their own brand of bikeways, trails, and one-of-a-kind dining and shopping. 10. RETURN INSPIRED by the Dayton region’s can-do, collaborative spirit. Dayton is a place where people with big ideas and loads of energy come together and figure out how to get things done. In Dayton, you’ll discover trail-related initiatives that can be accomplished in any community with the same tenacity toward improving access to its trails. 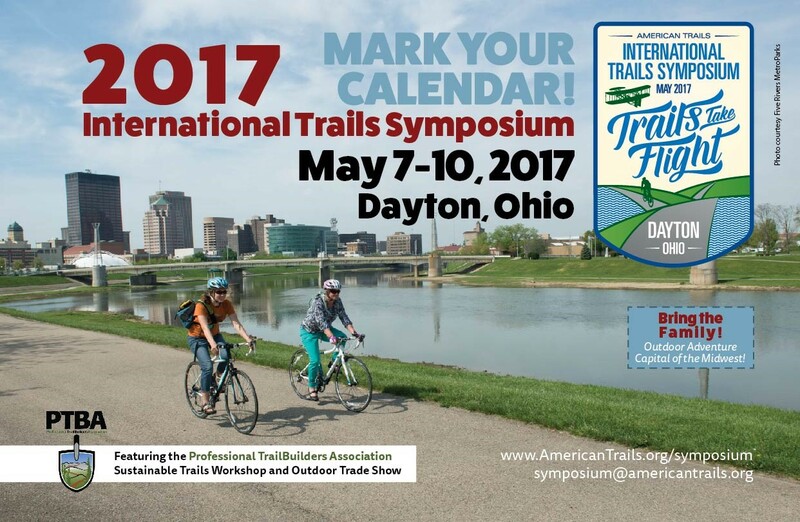 We invite you to exhibit and attend the Free Public Event “Building Public Awareness for Trails” which is the kick-off event of the 23rd American Trails International Trails Symposium on Sunday, May 7, 2017 at the Dayton Convention Center in downtown Dayton, Ohio. This event will provide the local community and attendees with an opportunity to visit exhibitors and learn about the Symposium and trails around the state and country. The exhibit hall will be open to attendees, guests, and local trail enthusiasts free of charge. In addition, local groups from around the Dayton area will provide information tables, presentations, and workshop activities for all ages. Entertainment will be provided and many fun activities are planned!